David Allen & Sons Ltd. This is a colour lithograph. A lithograph is a picture made by printing from a flat surface (traditionally stone, now often a metal plate), on which the artist draws or paints the original design with a greasy substance like chalk. The surface is next prepared, moistened and inked; the greasy printing ink adheres to the design, which is then printed onto a sheet of paper. For a colour lithograph, a separate surface is required for each colour. The poster is 6-sheet format. British poster dimensions were based on the double-crown sheet unit which measures 30 by 20 inches. Since this poster measures roughly 90 x 40 inches, its size equals 6 double-crown sheets. Standardisation of sizes (4-sheet, 6-sheet, 8-sheet, 16-sheet, etc.) meant that bill posters could paste posters on the hoardings in modular fashion. The point of this poster is to advertise Colman's Mustard: the name of the product is spelt out in bold so that it can be read at a distance. The artist, John Hassall, cleverly illustrates both the product itself (seen in the packet on the fire), and its usage (shown by the huddled figure of an exhausted gold prospector). Mustard baths are traditionally made by mixing a spoonful or two of roughly-milled mustard into a foot-bath of hot water; the effects are notably warming and relaxing. The poster makes capital out of a current event - the Klondike Gold Rush. Gold was discovered in the valley of the Klondike River, in the Yukon territory of north-western Canada, in 1896, and hopeful prospectors rushed to the scene. After a few years, the gold petered out and many adventurers returned home disappointed. 'To Klondyke'. 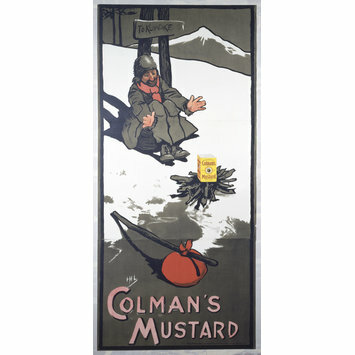 Colour lithograph poster (on two sheets joined together) advertising Colman’s Mustard. A bearded man, wearing a brown coat and hat and a red scarf, sits wearily on a snowy hilltop in front of a signpost pointing 'To Klondyke'. He 'warms' himself in front of a pile of twigs on which he has placed a box of Colman's Mustard. His stick and bundle of clothes covered in a red handkerchief are on the ground; behind is a snow-topped mountain. The colours are predominantly brown and white, with black outlines and red accents, except that the mustard box is Colman's distinctive yellow. On the signpost within design. In pink against a brown background, across bottom. Designed in London by John Hassall, RI, RWA (born in Walmer, Kent, 1868, died in London, 1948); issued by S.H. Benson (advertising agent), London, for J. & J. Colman Ltd.
'To Klondyke'. 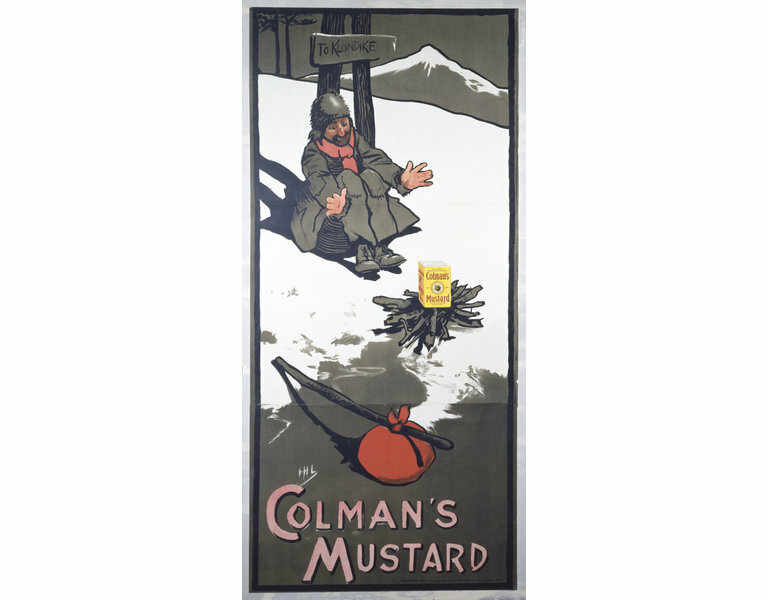 Colour lithograph poster (on two sheets joined together) advertising Colman’s Mustard. Colour lithographic print on paper. Designed by John Hassall. Issued by S. H. Benson. Printed by David Allen & Sons. Great Britain. 1898. The Poster, Vol. 1, July to December 1898, page 53. This humorous poster refers to the Klondike Gold Rush that followed the discovery of gold in the valley of the Klondike River in Canada in 1896. Using expressive outlines and simple colours, the designer shows a prospector warming himself before a box of Colman’s Mustard. For the sequel 'Returned From Klondyke', see E.23-1973.